TAFTA: How and why does it threaten U.S. vitamin freedom? APRIL 2014 – The proposal for a “Trans-Atlantic Free Trade Area” (TAFTA) is being strongly pushed by the Trans-Atlantic Business Council (TABC). Representing over 70 multinational corporations headquartered in the U.S. and EU, TABC’s member companies include some of the largest pharmaceutical, chemical, petrochemical and financial sector companies on the planet. When evaluating the potential impact of TAFTA upon U.S. vitamin freedom, it should be noted that TABC has a working group that deals specifically with pharmaceuticals, biopharmaceuticals, medical devices and over-the-counter drugs. One of the key priorities of this group is the transatlantic “harmonization and alignment of intellectual property protection and enforcement” – in other words, the protection and enforcement of drug patents. Vitamins and other effective micronutrient therapies that optimize cellular metabolism threaten the Pharma Cartel’s drug patent model because they target the cellular cause of today’s most common diseases – and, as natural substances, they cannot be patented. 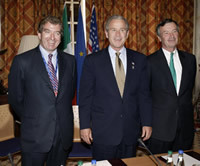 Former U.S. President George W. Bush had close links to the Executive Board of the Transatlantic Business Dialogue, having met personally – at an EU-U.S. summit in Ireland in June 2004 – with the then TABD EU chairman Niall FitzGerald (Chairman and CEO of Unilever) and the interim TABD US chairman Michael Eskew (Chairman and CEO of UPS). The highest forum within TABC is the so-called “Trans-Atlantic Business Dialogue” (TABD). Describing itself as a “CEO-driven business organization”, TABD functions as an executive advisory group within TABC. Bringing together business and government at the highest levels, TABD provides its member executives with high-level access to U.S. Cabinet Secretaries and European Commissioners. It has traditionally provided a set of policy recommendations ahead of each U.S.-EU Summit – and, on occasion, even presented these to U.S.-EU Leaders at the Summit itself. Significantly therefore, at the current time of writing, one of TABD’s co-chairs is a senior vice-president of one of the world’s largest drug companies, Eli Lilly. In November 2000, TABD’s dietary supplements sector-working group announced that it had agreed on “several key elements of harmonize the regulatory framework for vitamin and mineral food supplements on both sides of the Atlantic.” This agreement, along with a little publicized EU-U.S. Summit that took place at the White House in Washington in 2007, essentially set in motion the moves towards harmonizing U.S. dietary supplement legislation to restrictive European regulations. The proposed “Trans-Atlantic Free Trade Area” is now viewed by Pharma interests as a key means of achieving this. Dr. Rath publishes scientific papers on his discovery that coronary heart disease is an early form of scurvy. Time magazine publishes a cover story entitled ‘The Real Power of Vitamins‘ which described how new research had shown they may “help fight cancer, heart disease and the ravages of ageing”. The triggering of a backlash from outraged natural health advocates, subsequently described by Newsweek magazine as “the largest movement since the Vietnam War”. The unanimous passing by both houses of the US Congress of the pro-natural health Dietary Supplement Health and Education Act (DSHEA). Signed into US law by President Bill Clinton on October 25, 1994, the campaign to pass DSHEA was described by renowned food and drug lawyer Peter Barton Hutt as being “without question the single worst legislative defeat that [the] FDA has ever encountered in its entire history.” (A summary and history of DSHEA can be found on the health.gov website). Acceleration of efforts by the United Nations’ Codex Alimentarius Commission to bring about a global ban on vitamin therapies and create a monopoly for the Pharma Cartel’s trillion dollar-a-year market in patented chemical drugs. Dr. Rath gives key lecture at the City Hall in Chemnitz, Germany, revealing that the German government – on behalf of the Pharma Cartel – was spearheading the Codex Alimentarius Commission’s efforts to ban natural therapies worldwide. Governmental representatives of the Brussels EU sign the Amsterdam Treaty. Under the guise of seeking to ensure “a high level of consumer protection” and “protecting the health, safety and economic interests of consumers,” the treaty prepares the way for the future restriction of vitamin therapies in Europe. (See Article 129a). Academics at the universities of Bath and Edinburgh in the UK subsequently publish evidence that multinational corporations including Bayer, Zeneca, SmithKline Beecham, Shell and others had engaged in a successful lobbying campaign to ensure the treaty emphasized business interests at the expense of public health. The night before a key Codex Alimentarius Commission meeting in Berlin, Dr. Rath holds a public meeting in which he charges the Pharma Cartel and its accomplices in politics, the media and science with mass murder. At a meeting in Cincinnati, Ohio, the dietary supplements sector-working group of the TransAtlantic Business Dialogue (TABD) agrees on “several key elements of harmonize the regulatory framework for vitamin and mineral food supplements on both sides of the Atlantic.” The necessary steps towards this were specifically stated as including the transatlantic harmonization of maximum permitted levels for vitamins and minerals in food supplements. Governmental representatives of the Brussels EU sign the Nice Treaty which enforced a so-called ‘qualified majority voting system’ for the European Council, thus reducing the ability of individual Brussels EU member states to oppose the interests of the Pharma Cartel. As a result, the three main Cartel countries – Germany, France and the UK – along with Italy, the third main producer of chemicals in Europe – now have the largest share of votes in the Council. The Treaty also increased and redistributed the number of seats in the European Parliament in favour of these countries. Dr. Rath publishes an announcement in the USA Today newspaper about his breakthrough in cancer research. At the behest of the Pharma Cartel and claiming the need “to ensure a high level of protection for consumers”, the Brussels EU Parliament votes to adopt a draconian “Food Supplements Directive” and begins planning for the setting of Europe-wide maximum permitted levels for vitamins and minerals in supplements via a highly disingenuous “risk assessment” process. Dr. Rath and the Foundation submit a formal Complaint to the International Criminal Court in The Hague. Detailing genocide and other crimes against humanity in connection with the Pharma Cartel’s ‘Business with Disease’ and the Iraq War, the Complaint specifically names the accused, lists the criminal charges against them and summarizes the evidence. Emboldened and aided by the Brussels EU, the Codex Alimentarius Commission adopts its so-called “Guidelines for Vitamin and Mineral Food Supplements” as a new global standard. The text of the Guidelines is based on the draconian “Food Supplements Directive” adopted by the Brussels EU three years earlier. German chancellor Angela Merkel meets with US President George W. Bush at the White House in Washington. 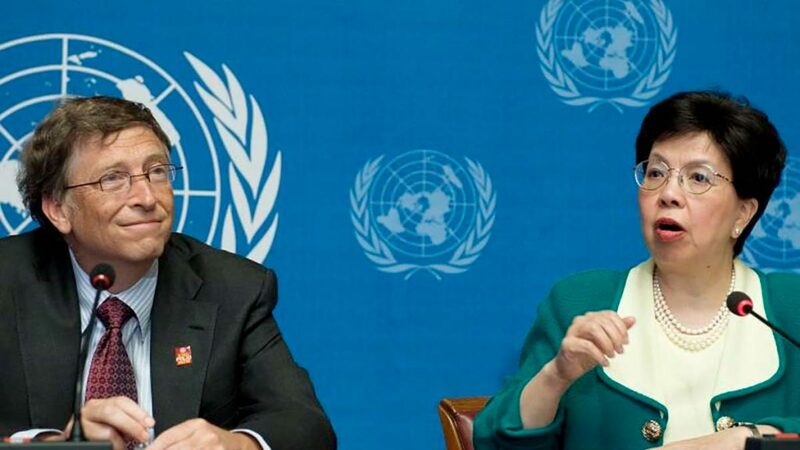 In a meeting that went almost unnoticed by many political observers, Merkel, who at the time held the presidency of the Brussels EU, promoted the idea of TAFTA to Bush. 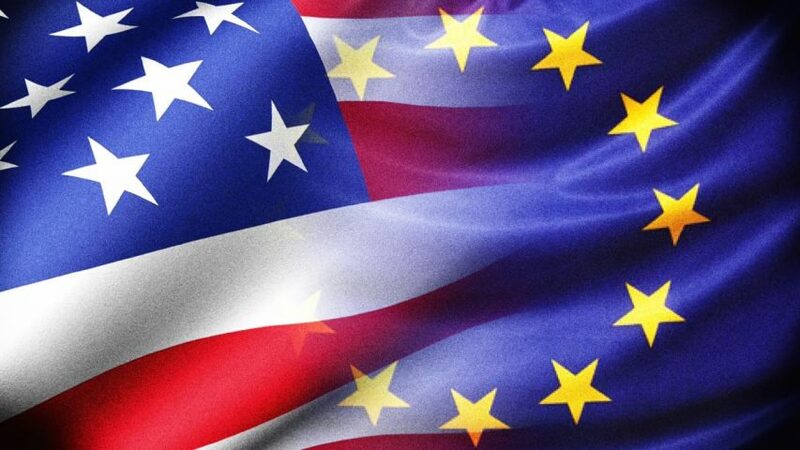 Within four months, a little publicized EU-U.S. Summit took place at the White House. To all intents and purposes, the background to this summit, and its outcomes, essentially laid the basis for the TAFTA negotiations that are taking place today. The Dr. Rath and the Dr. Rath Health Foundation publish tens of thousands of pages of original historical documents online proving that the Oil and Drug Cartel were behind WWII. In an Open Letter published in the New York Times, Dr. Rath announced that the historic records from the Nuremberg War Crimes Tribunal against the IG Farben Cartel were now available for public download and study. Governmental representatives of the Brussels EU sign the Lisbon Treaty. A clear step towards the implementation of a corporate dictatorship, it forms the basis of a future Europe – and a model for the world – that is fundamentally undemocratic. The Dr. Rath Health Foundation publishes “The Nazi Roots of the ‘Brussels EU'”. Based on historical documents recovered from international archives, the book provides indisputable proof that the key architects of the Brussels EU were recruited from among the same technocrats who had previously designed the plans for a post-WWII Europe under the control of the Nazis and the IG Farben Cartel. In his State of the Union address, President Obama announces that his Administration plans to notify Congress of its intent to launch negotiations on a “Transatlantic Trade and Investment Partnership” with the Brussels EU. WHY ARE “FREE TRADE AREAS” AND CONTINENTAL POLITICAL UNIONS BEING CREATED? Expanding tarif-free exports from Cartel countries to the rest of the world. Enforcing long-term economic dependency on the Cartel. Eliminating natural therapies by influencing national legislation under the cloak of “international trade harmonization”. Exporting the Brussels EU model worldwide. AFRICA The architects of the African Union (AU) have not hidden the fact that it was modeled on the Brussels EU and are giving it almost identical structures – including an African Union Commission consisting of unelected appointees entrusted with executive functions. Despite the economic devastation that the creation of the euro currency has inflicted on the countries of Europe, East African Union countries are already planning a Brussels EU-style common currency. ASIA In 2009, leaders of East Asian countries announced they had laid the groundwork for a Brussels EU-style bloc that would cover half the world’s population. The plans echoed similar ones outlined by the former Australian Prime Minister, Kevin Rudd, in 2008. The Brussels EU already works closely with the Association of South East Asian Nations (ASEAN) and finances projects in the region. SOUTH AMERICA The Brussels EU signed a trade agreement with the Andean Community in 2012 and is currently negotiating an agreement with Mercosur which will also cover political cooperation. A continental political union between the Andean Community and Mercosur, modeled on the Brussels EU, was created in 2008. Further details on the multifarious relationships the Brussels EU has with countries and regions can be found in the Trade section of the Brussels EU Commission website.